For Disconnected Vol 1, we asked some of the UK’s brightest comic writers and artists to bring us those small town stories that don’t make the big city press. Stories that happen on your doorstep, real life with a splinter through it. Stories that are true, even if they never happened. Disconnected Vol. 1 launched at Bristol Comic Expo in May 2012. After two sold-out print runs, we have decided to go DIGITAL ONLY with Disconnected Vol.1. We’re just setting up the digital version for download and it will be on sale very soon – watch this space for more info! Conor Boyle is currently producing graphic novels for Markosia and Accent UK. He was part of the artistic team for Barry Nugent’s Tales of the Fallen, and drew Dark Judgement 1 and 2 for FutureQuake Press. Find out more at http://pencilmonkeymagic.blogspot.com. Lizzie Boyle is a writer of comics and fiction. She has been published by Hallowscream, Dr WTF! ?, Paragraph Planet and Microhorror and will soon feature in FutureQuake’s Something Wicked. She has been shortlisted for the Fish Publishing Short Story Prize and the Flash500 Flash Fiction Competition. Read more of her work at lizzieboylesays.wordpress.com. Jim Campbell is a professional comic book letterer who has worked with Classical Comics, Dark Horse, Image, Markosia and many others. He knows more about lettering than any man should. Without him, we would live in a world of Comic Sans and crossbar i’s and all be a great deal worse off. Find out more at his ClintFlicker blog here. Kris Carter‘s colours have graced the pages of Transformers, Dr Who, TMNT and Torchwood. He has also contributed to the Welsh creators anthology book 10thology, and is the co-writer/colourist/letterer/designer for Lou Scannon, an Eagle Award nominated small press indie book. More colours on his website. Richmond Clements has recently published Turning Tiger, available from Renegade Arts Entertainment, and was featured in Barry Nugent’s Tales of the Fallen. He is currently writing a series called Black Dragon for Strip Magazine, whilst also working on graphic novels for Com.X and Markosia. He is one of the coordinators of Hi-Ex, the Highlands International Comic Expo. Tom Foster has worked professionally as a graphic designer and illustrator, and was the illustrator for the film The Yes Men Fix The World.He has long held a desire to draw comics, and his talent was recognised as one of the finalists in the 2000AD Portfolio Competition at ThoughtBubble 2011. The Inspection is his first published sequential work. See more of his art here. Dominic Howe was born in January 2012. 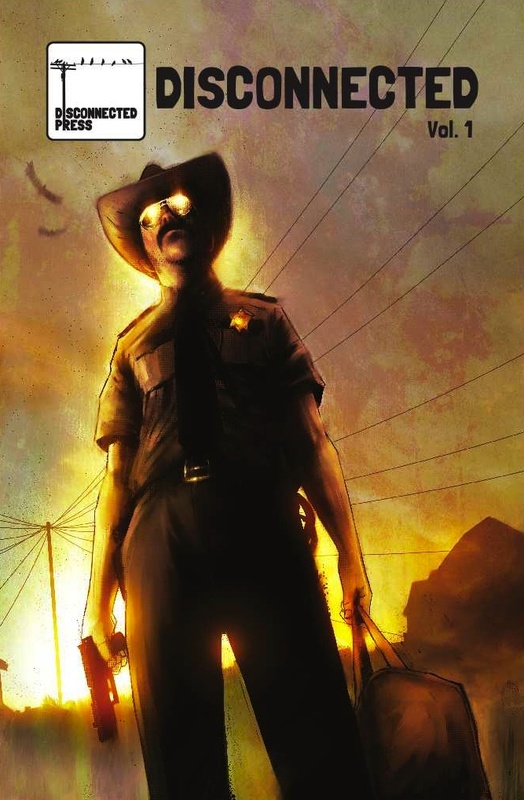 Disconnected Issue 1 is his first comic. Rich McAuliffe wrote Damaged Goods and Baby Boomers, both published by Markosia, and Dark Judgement 1 and 2 for FutureQuake Press. He has also contributed to 10thology. He is one of the voices behind the Everything Comes Back to 2000AD podcast and the Awesomecast. Greg Meldrum has been published in the psychedelic time travel anthology Dr WTF! ?, the Strontium Dog fanzine Dogbreath, Temple APA and several issues of Paragon. He lives in the North East of Scotland, close to the location for his story Lay On, Macduff. Gavin Mitchell is a freelance illustrator with a growing portfolio of comic work and an impressive beard. He was the winner of the 2000 AD Portfolio Challenge at ThoughtBubble 2011. He is currently working on small press comics Stiffs and The Pride and has contributed to several anthologies. Find out more here. Matt Timson’s art has been seen in Impaler and The Darkness (for Top Cow), 45 (for Com.X) and in SelfMadeHero’s Lovecraft Anthology 2. His doodles make other artists weep. Visit his website. Stuart Tipples wrote and drew Blood and Sacrifice for the Into the Woods anthology compiled by Stacy Whittle. He has also been featured in 10thology, Self-Made Hero’s Nevermore and Monkeys with Machineguns. He is part of the Capekiller team who make some of the finest T-shirts in the land. Read more here. Disconnected Vol 1 will shortly be available for download; after two sold-out print runs, we are taking the comic digital only. Watch this space for details of how to download.